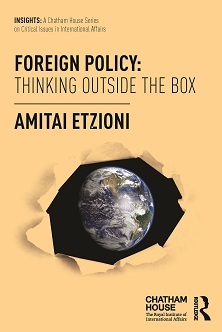 This collection of essays by renowned scholar Amitai Etzioni challenges readers to reconsider their basic assumptions about the making of foreign policy. With chapters focusing on the Middle East, China and the EU, as well as articles with a more global focus, the book offers thought-provoking and insightful perspectives on international foreign policy that challenge existing academic debate in the field.The book will be of great interest to students, scholars and practitioners of foreign policy and international relations, as well as to general readers wishing to deepen their understanding of this area. Foreign Policy: Thinking Outside the Box is the first book to be produced as part of Insights: A Chatham House Series on Critical Issues in International Affairs, published in conjunction with Routledge, Taylor & Francis Group.